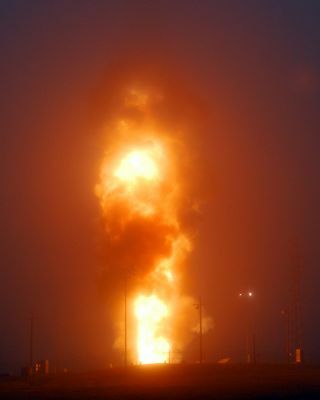 A U.S. Air Force Minuteman 2 missile burns through the fog at Vandenberg Air Force Base, Calif., after launching in a June 10, 2011 weapons test. While this test was successful, a later test on July 27, 2011 was not and the missile in that later flight was intentionally destroyed, Air Force officials said. The U.S. Air Force destroyed an intercontinental ballistic missile just after its launch early Wednesday (July 27) after a malfunction that prompted safety concerns, Air Force officials said. The unarmed Minuteman 3 missile blasted off from Vandenberg Air Force Base in California at 6:06 a.m. EDT (1006 GMT) and suffered debilitating anomaly that forced flight controllers to terminate the rocket as it soared over Vandenberg's western launch range. Wednesday's missile launch was an operational weapons test to determine the Minuteman 3 missile's reliability and accuracy, Air Force officials said. The missile's single unarmed re-entry vehicle was expected to travel about 4,200 miles (6,759 km) and end up at a target southwest to the Kwajalein Atoll in the Pacific Ocean, they added. The Air Force's Minuteman 3 intercontinental ballistic missile has a range of more than 6,000 miles (9,656 km) and can travel at speeds of up to Mach 23 (15,000 mph or 24,000 kph). During peak flight, the missiles can reach heights of up to 700 miles (1,120 km) above Earth before plunging back down toward their targets. That means that the weapons fly higher than the International Space Station, which orbits Earth at an altitude of about 220 miles (354 km), when they hit the top of their trajectories. The first Minuteman 3 ICBMs were produced in June 1970, with production shutting down in December 1978, according to an Air Force fact sheet. The Minuteman weapons system was initially conceived of in the late 1950s as a strategic weapon with an intercontinental range to serve as strategic deterrent force for the U.S. military.